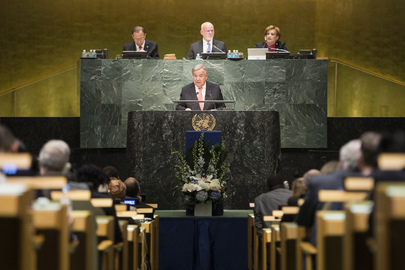 The Secretary-General reports to the General Assembly on many topics. All reports for the General Assembly have document symbols that begin with A/--. The Secretary-General's annual report on the work of the Organization provides an overview of the highlights of the previous year and indicates the major areas of activity. This report may include information about activities the Secretary-General undertook without a request from another principal organ, such as, good offices and investigations into situations not considered by the General Assembly or Security Council. The Secretary-General reports to the General Assembly on topics related to the agenda for the session and on other topics as requested by a resolution. The agenda item for each report appears on the document. The first paragraphs of a report will usually cite the resolution that calls for the report.